Title: Mother Goose’s Little TreasuresAuthor: Opie, Iona ArchibaldIllustrator: Wells, RosemaryGenre: Mother Goose Nursery Rhymes Theme(s): Rhymes, Poetry Opening line/sentence: Here comes Solomon in his glory,Riding on a milk-white pony,Up the Hill in all his glory,All for Susie’s wedding:Om, pom, Susianna, On, pom Susianna, Om, pom Susianna,All for Susie’s wedding.Brief Book Summary: These not so familiar nursery rhymes are some of Mother Goose’s treasured rhymes. They are silly and unusual unlike like typical Mother Goose’s rhymes that are usually heard. Professional Recommendation/Review #1: •	Booklist, Sep. 1, 2007In her introduction, Opie notes, If I am Mother Goose s self-appointed treasurer, then Rosemary Wells is definitely her illuminator. Truer words were never spoken. This gem, comprising 22 tidbits from little-known nursery rhymes, shines with the charm of old-time rhymes and with Wells beloved animal and child characters, set down in her signature style. As with familiar Mother Goose rhymes, the ones here don t always make sense, but they exude syncopated silliness and fun: Mrs. Whirly / Mrs. Whirly sells fish, / Three ha pence a dish; / Don t buy it, / don t buy it, / It stinks / when you fry it. What s more, the quirky nature of many of the rhymes provides a clean slate for Wells inspired playfulness. This title joins Opie and Wells two previous collections, My Very First Mother Goose (1996) and Here Comes Mother Goose (1999), to form a exceptional trilogy, which given that Wallace Tripp s Granfa Grig Had a Pig (1976) and Arnold Lobel s Gregory Griggs and Other Nursery Rhyme People (1978) are now hard to find will keep Mother Goose s less-familiar rhymes alive. Like Tomie dePaola s Mother Goose (1985), this third Opie-Wells treasury of treasures is likely to become a staple in children s collections.Professional Recommendation/Review #2: •	The Bulletin of the Center for Children s Books, December 2007Quintessential gatekeeper of the world of nursery rhymes, Opie returns with a new collection of twenty-two compact rhymes. The selections are unusual, ranging from comparatively recent jump-rope rhymes ( Going to Kentucky ) to centuries-old carols ( The Moon Shines Bright ) to an authored popular song of the 1920s ( Chick Chick Chick Chick ) in keeping with her observations about the breadth of youthful usage. It s too bad there are no notes to explain these varied sources (the introduction in fact misleadingly states No one knows who wrote these snatches of song, when at least one has author and copyright date easily identifiable) and to annotate some changes from their usual appearance (who changed the song When Cockle Shells to the non-scanning When the Cockle Shells ? ), and musical notation would have been helpful in several cases, but the verses are a quirky and recitable crew sure to involve a young audience. Working in a shimmering palette of watercolors and relying often on delicate brushstroke patterns for texture, Wells creates a world of running human and animal characters (blue-haired Mrs. Whirly is also an actor in Little Old Dog Sits under a Chair, for instance) who parade in together with Here Comes Solomon and reconvene happily in the concluding Before It Gets Dark. To some verses she adds her own stories, for others she opts to focus on characters or elements rather than plot, but the result is both attractive and filled with character. Fans of Opie s previous nursery titles will want to add this one and broaden their horizons.Response to Two Professional Reviews: These reviews help provide insight on some of the rhymes in Mother Goose’s Little Treasures. They also mentioned that these nursery rhymes are rare and are created to be silly and unique. Both reviewers mentioned all positive aspects of this book that would tell me if it were appropriate for the children I would be teaching. Evaluation of Literary Elements: The pictures in this book play a huge role. The lightly painted pictures and soft colors create a comfortable and inviting world for the children. The pictures also provide background information on each nursery rhyme to create a scene for the students to imagine. Consideration of Instructional Application: The verses in these nursery rhymes are easy for children to understand and have plenty of personality. As an activity to let the student’s branch out, they can have an opportunity to great dance movements to go along with a song they enjoyed. This could be done as a group or individually. This activity will help the students fully understand what the words mean in each rhyme they chose. 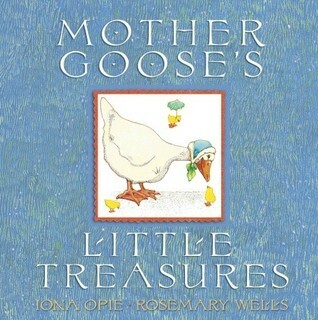 Mother Goose's Little Treasures (2007) is a compilation book of 22 old stories (mainly prose with seldom rhymes) transcribed by Iona Opie and illustrated by Rosemary Wells. Each story/rhyme prose takes up 2-4 pages due to the illustrations; most stories consists of 4-10 lines, with a rhyme every 2 or 3 lines. Due to the simplicity, most stories use general descriptions and terms to create small arcs (if any). The illustrations usually portray animals personified as humans or doing human activities and artistically, uses a wide array of colors to display some realism, but there's barely any use of perspective or dimensions to show any depth. The target audience for this book would range between early developers (age 3) to K-1 students (age 5-7) and serve as an introduction into visual and vocabulary literacy. The book can be read by parents and educators to young children or read independently by K-1 students for fun and leisure. As an adult, I wasn't too big a fan of the stories, rhymes or illustrations and wouldn't personally use this book but I can see why early educators use the book as an introduction for young students into the world of reading. Title: Mother Goose’s Little TreasuresAuthor: Iona Opie and Rosemary WellsIllustrator: Iona Opie and Rosemary WellsGenre: Nursery Rhyme/Mother GooseTheme(s): Animals, Rhyming, and FarmsOpening Line/sentence:Here comes Solomon in all his glory, Brief Book Summary: This book is a collection of short nursery rhymes ranging from Rosy Apple (about a captain’s daughter) to Oats and Beans and Barley (a rhyme about how each grow). This book is filled with pastel animals and children to illustrate the various stories. Each story tells about someone either doing something ordinary, or some weird trait about that person. Also this book has describing rhymes in it about various objects.Professional Recommendation/Review #1:Kirkus (Kirkus Reviews, August 1, 2007 (Vol. 75, No. 15)) When the rain raineth / And the goose winketh, / Little knows the gosling / What the goose thinketh." Naming herself (with some justice) "Mother Goose's self-appointed treasurer," Opie digs deep into the coffers for 22 lesser-known nursery rhymes "mysterious fragments," she calls them, "long-ago laughter of little meaning and echoes of ancient spells." The illustrations pick up on this air of otherworldliness; Wells's smiling human and animal figures, all in antique dress, are a bit smaller in these settings, and look less solid than in her bigger, more intimate collaborations with Opie, My Very First Mother Goose (1996) and Here Comes Mother Goose (1999). The pictures may suggest scenarios for some of the more abstract lines here, but young goslings will still benefit most not by trying to make sense of the gnomic verses, but just listening to the rhythms of sound and language in them. Professional Recommendation/Review #2: Julie Cummins (Booklist, Sep. 1, 2007 (Vol. 104, No. 1)) Starred Review* In her introduction, Opie notes, If I am Mother Goose s self-appointed treasurer, then Rosemary Wells is definitely her illuminator. Truer words were never spoken. This gem, comprising 22 tidbits from little-known nursery rhymes, shines with the charm of old-time rhymes and with Wells beloved animal and child characters, set down in her signature style. As with familiar Mother Goose rhymes, the ones here don’t always make sense, but they exude syncopated silliness and fun: Mrs. Whirly / Mrs. Whirly sells fish, / Three ha pence a dish; / Don t buy it, / don t buy it, / It stinks / when you fry it. What s more, the quirky nature of many of the rhymes provides a clean slate for Wells inspired playfulness. This title joins Opie and Wells two previous collections, My Very First Mother Goose (1996) and Here Comes Mother Goose (1999), to form a exceptional trilogy, which given that Wallace Tripp’s Granfa Grig Had a Pig (1976) and Arnold Lobel’s Gregory Griggs and Other Nursery Rhyme People (1978) are now hard to find will keep Mother Goose’s less-familiar rhymes alive. Like Tomie de Paola’s Mother Goose (1985), this third Opie-Wells treasury of treasures is likely to become a staple in children’s collections. Response to Two Professional Reviews: The first review comments on the book’s ability to capture a “perfect world” feeling, this, is comforting for young children. Both reviews connect this piece of work with previous Mother Goose’s tales claiming that the playfulness of these rhymes is similar to the more familiar rhymes. Also both reviews seem hopeful that this book would be a nice addition to a child’s early library, I beg to differ. I think this book, despite its clever rhyming, is filled with incomplete thoughts and rhymes that make little sense. I was confused when reading this book and couldn’t find the meaning or purpose of many on the rhymes. Evaluation of Literary Elements: This book lacks a consistent plot. It is a compilation of individual stories that are in no way connected to each other making the book easy to jump around from page to page. The target audience is clearly very young children, preferably infants and toddlers and the illustrations support this. The pastel images of personified animals have a whimsical feel that invites a young reader to imagine animals as people almost if a child’s stuffed animal had come alive. Many of these images reflect common nursery colors with light shades appropriate for babies. The words of this book focus not on constructing meaning to tell a story, but instead on the actual word play itself. By using some nonsense words the reader is exposed to letter sounds that help create the rhyming rhythm of the book. The book’s use of tongue twisters and playing on word order expose young children to the many different conventions of writing early on.Consideration of Instructional Application: This book targets an age group a little too young for elementary children, however this book could be a useful resource when teaching rhyme scheme and creating writings that have a rhythmic beat to them. Many Mother Goose rhymes make good songs so using this book to create a class song could be a fun lesson. The way this book is set up to have multiple individual stories lends well to reading this book up on different days or stopping and starting in various spots without interrupting the plot. I would not use this book to teach any sort of content; it is more for basic word skill building. Also with it’s catchy rhythm this book would make a good read aloud and could be used to help kids predict the next words based on the rhyme scheme. Opie, Iona; Wells, Rosemary. Mother Goose's Little Treasures. Candlewick Press. Cambridge, Massachusetts.This Mother Goose book contains a series of short rhymes/poems with beautiful illustrations. It is a collection of 22 poems/rhymes. Some of the themes contained in the book are going to bed, chores/daily work, going in and out, holidays (Easter - in "Chick Chick Chick Chick"). The strengths are in the rhyme schemes. A young child would be able to pick out the words that rhyme while listening to the various rhymes. The edition I got from the library is a hardcover. It is sturdy and big. The font is a calming blue and large in size which is helpful to young readers. Most of the pages in the book are all different colors. The different colors indicate a different rhyme. The rhymes typically have a two-page layout with the exception of "In and Out the Windows" and "Chick Chick Chick Chick". I cannot tell exactly what medium (possibly crayon or pastel) was used for the illustrations but they truly steal the show. The art takes up most of page, but not in an overwhelming way. The illustrations support, give more details, and provide imagination to the text but does not undermine the text. Prior to my reading this, I had not heard or read any of the poems contained in this collection and I feel others would say the same. It is a strength because these would be new to readers. It is a weakness because Mother Goose rhymes are typically widely known. Because the readers would be unfamiliar with these rhymes, the nostalgia typically invoked with Mother Goose rhymes would not particularly be evoked when reading this particular edition.Target audience: Preschool - 2nd Grade. I hadn't heard of a number of these short and delicious rhymes, all rich with rhythm and nonsense and cha cha hurdy gurdy fun. Children with their serious schools and no child left behind testing and cell-phone ears need to get their sillies in fast and quick while they're young. Rosemary Wells' illustrations compliment the telling of nursery rhymes with perfection - fantasy rooted in commonplace, serious farmer roosters and bunnies and chickens on the phone and Handy Spandy pipers in striped hats all seem possible in her warm and colorful world. Note to grown-ups alarmed that the rhymes make no sense...add an "n" and that's the deal, squeal. All of the Iona Opie/Rosemary Wells collections are fabulous. This one has a wonderful little rhyme called "The Leaves Are Green", which the kids love to play as a ring-around-the-rosie game. This was an excellent collection of rare Mother Goose rhymes. Some I found vaguely familiar and others I had never encountered before. All had that distinctly Mother Goose feel that we love so much. This is a nice version of some of the less well known Mother Goose rhymes. The illustrations are simple but nicely done! This has the sweetest illustrations. The illustrations are very cute. Not the most popular Mother Goose Rhymes. Iona Opie Rosemary Wells - Iona Archibald Opie is a folklorist of children's literature and verse.